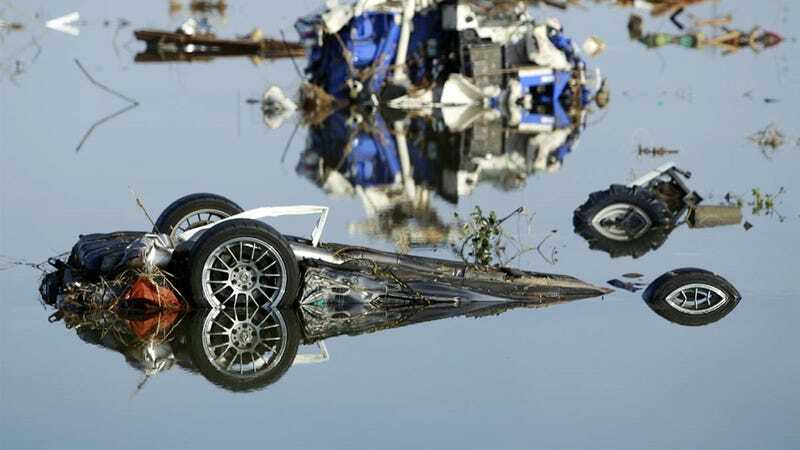 A wrecked sports car sits in flood waters in Soma city, Fukushima prefecture on March 14. Cargo containers are strewn about in Sendai Japan March 12. Japan launched a massive military rescue operation Saturday after a giant, earthquake-fed tsunami killed hundreds of people and turned the northeastern coast into a swampy wasteland, while authorities braced for a possible meltdown at a nuclear reactor. A Japanese Air Self Defence Force plane pushed into a hangar by the tsunami at a base in Higashimatsushima in Miyagi prefecture on March 14. Cars of a train lie overturned in Shinchi March 12 after being washed away by an earthquake-triggered tsunami. The powerful tsunami created by one of the strongest earthquakes ever recorded swept away Japan's east coast. Burned-out cars are pictured at Hitachi Harbour, Ibaraki Prefecture in northeastern Japan March 12. A vessel sits after it was washed away by tsunami into urban area in Kesennuma, Miyagi, northern Japan March 12. A pleasure boat sitting on top of a building amid a sea of debris in Otsuchi town in Iwate prefecture on March 14. A train station vanished from where it once stood in Minami Sanriku, Japan, March 13. An "SOS" signal is written on the sports field of a high school in Minami Sanriku, Japan, March 13. People are dwarfed by a freighter that sits on a breakwater in Kamaishi in Iwate Prefecture Sunday. A vehicle sits on a three-story building at Minamisanriku town in Miyagi prefecture Sunday after tsunami damaged the area. A fishing boat washed away by tsunami sits overturned Sunday in Hachinohe, Japan. A earthquake-damaged road is seen Sunday in Sendai, Japan. A half-meter resolution satellite image of Sendai, Japan, at left, was taken by the GeoEye-1 satellite on Nov. 15, 2009. The one-meter resolution satellite image at right shows the same area Saturday, one day after an 8.9-magnitude earthquake struck the Oshika Peninsula. Natori, Japan, is shown on April 4, 2010, left, and after the earthquake and tsunami on March 11, 2011, right.